The skilful integration of indoors and outdoors was the architects’ driving concept behind the design of this new house in Norway’s Tønsberg, created by Sem-based firm Vårdal Arkitekter. ’The whole house, including the roof, is made to blend with the existing topography of the area,’ explains project architect Håvard B Olsen, who led the design. 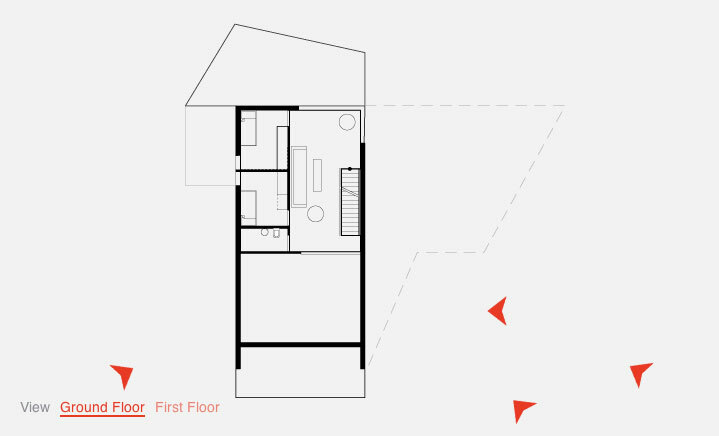 ’We focused on getting good sunlight in all rooms, views and floating connections between inside and outside.’ To achieve this, the modern building is carved asymmetrically into the land; a clear break from the norm within its quiet residential neighbourhood. When this commission for a new-built family home came in, Olsen was faced with the challenge of creating something that is fresh and contemporary, but at the same time doesn’t clash with the area’s overall architectural character. The brief - for a home for a family of four - outlined a design that would be fit for the rigours of everyday family life, but would also benefit from ample sunlight, frame external views and provide access out from every level. An additional, separate living space incorporated in the basement, would serve as rental or visitor accommodation. The house’s main entrance is on the ground level. A corridor leads to a double garage and the living areas above. The first floor’s open-plan arrangement incorporates kitchen, dining and living areas, which open onto a balcony through a set of large sliding windows. This outside space extends out from the main volume, morphing into the roof of the garage below. The master bedroom and bathroom are located on the same floor, whilst the level above hosts two children’s bedrooms and an additional, smaller seating area, which leads to a second south-facing terrace. A minimal material palette includes concrete and Siberian larch (partly cladding the exterior), which helps the house blend with its natural surroundings. The choice of materials also provides low maintenance surfaces for the busy working couple. The larch used externally acquires a beautiful patina overtime, allowing the house to slowly transform and merge further into the landscape as time goes by.